This luxury home would not be complete without the four small square window grills and the large arched window design to compliment the total work of art in this architectural delight! .. Custom ironwork insert created for the arched display shelf. .. 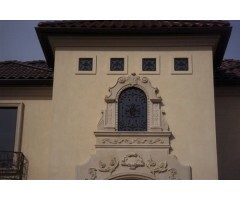 This scrollwork window grill completes the total picture of this home. .. The deep window sill on this master bath window created a perfect place for a plant and this arched ironwork to complete the room. .. Arched scrolled ironwork placed in this "pass-through" from the kitchen to the great room was a stunning addition to the home. .. 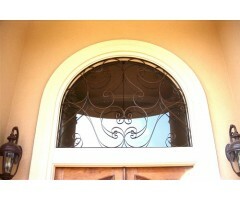 These double arched windows are perfectly appointed with custom iron inserts - adding elegance and security to this home. .. The contemporary lines on this home were softened with the large modern romantic scrolled window panels. ..
Black iron window insert adds a beautiful architectural detail to this red brick home. .. The latticework and scroll combination is perfect for this half circle stone wall window - creating luxury to the landscape. .. The delicacy of this large open scroll design is exquisite on this home. .. 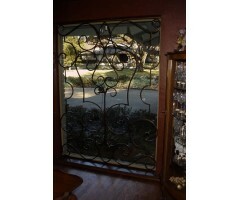 The iron window grills on these built in cabinet doors added a visual "pop" to the room. .. Pure Class!! 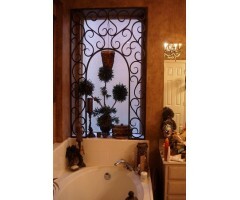 This window grill is set on the inside of the window adding great appeal to the room and the exterior of the home. ..